Florence Gains Strength As A Category 4 Hurricane, Aiming At U.S. East Coast The storm gained winds of 140 mph — a day earlier than predicted, and it is expected to intensify as it crosses over water. Forecasters predict Florence will hit the Eastern Seaboard on Thursday. Hurricane Florence is expected to hit the Southeastern U.S. coast as a major hurricane on Thursday or Friday, after rapidly intensifying. A hurricane watch has been issued for the U.S. east coast from Edisto Beach, South Carolina to North Carolina-Virginia border, including the Pamlico and Albemarle sounds., with storm surge watches encompassing the same area. 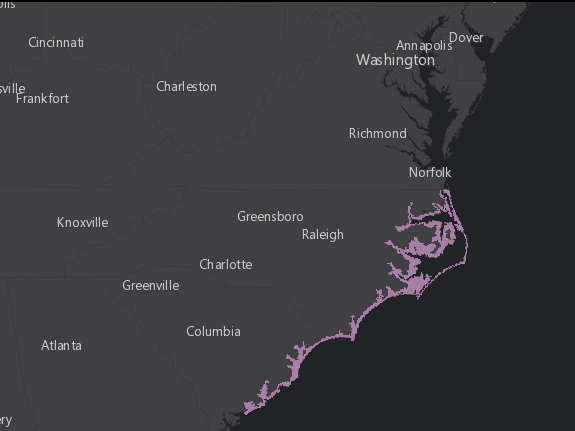 Coastal areas likely to be affected by storm surge from Hurricane Florence. Swells generated by the hurricane are already affecting portions of the East Coast and Bermuda. The center said the powerful waves are likely to cause life-threatening surf and rip current conditions. Additionally, Florence, about 1,000 miles southeast of Cape Fear, N.C., is predicted to bring "life-threatening impacts" to North Carolina and neighboring states late this week. Mandatory evacuation orders have been issued by the governors of North and South Carolina and Virginia for coastal areas. The storm quickly strengthened on Monday and by midday was reclassified as a Category 4 hurricane, reaching that status a day earlier than experts had predicted. The hurricane center cited data from a NOAA Hurricane Hunter aircraft that showed Florence was rapidly intensifying, with maximum sustained winds near 140 mph. In an earlier update, officials said Florence's winds could reach 150 mph over the next 36 hours. The storm is already 500 miles wide — meaning a large area will be at risk when it nears land. The NHC says hurricane-force winds can be expected 40 miles from the center of Florence, while tropical-storm force winds extend out 150 miles. Hurricane Florence, at center, is a Category 4 storm heading for the Carolinas. 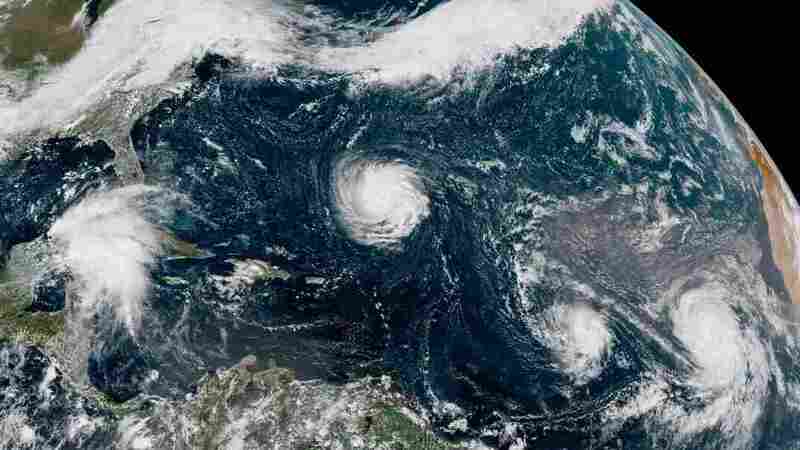 To the east, hurricanes Isaac and Helene (far right) are seen in the Atlantic Ocean. To the west, a tropical disturbance has developed over the northwest Caribbean Sea. The hurricane's impacts could range from a strong storm surge to flooding from torrential rainfall and hurricane-force winds. 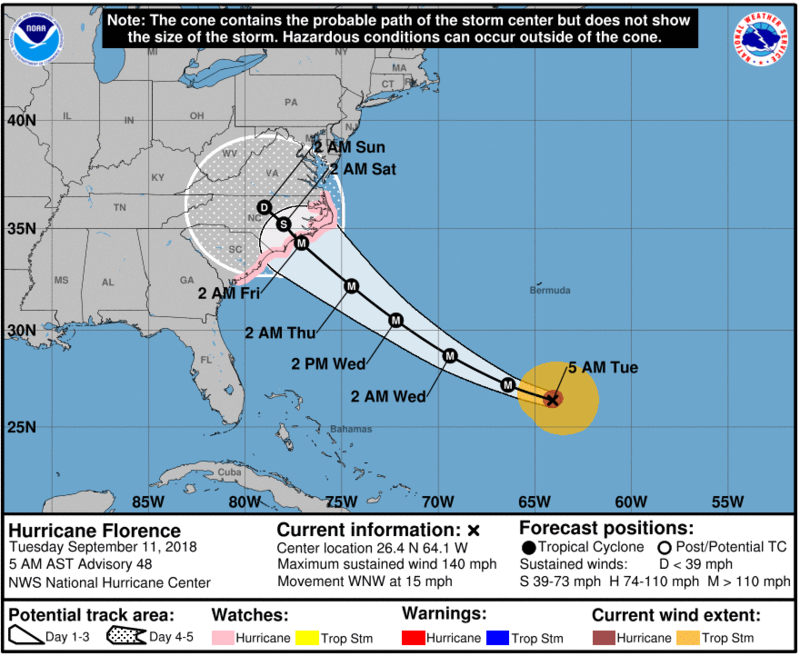 Forecasters warn that the predicted track is likely to change — but for now, it shows the strong hurricane bearing down on the North Carolina coast, with a potential landfall north of Wilmington. Once it makes landfall, Florence is predicted to stall and remain over North Carolina for at least 24 hours — increasing the threat of dangerous flooding, NHC Director Ken Graham said on Monday. Even in areas far from the coast, he added, parts of North Carolina and Virginia could see rain totals of 10-15 inches over the next seven days. As of 5 a.m. ET Tuesday, Florence was moving at 15 mph, some 500 miles south-southeast of Bermuda, the hurricane center said. As meteorologist Stu Ostro of The Weather Channel reports via Twitter, since 1851, only four Category 4 hurricanes have made landfall north of Florida on the East Coast. The northernmost landfall was made by Hazel, a devastating and deadly storm that struck close to the South Carolina/North Carolina border in October 1954. Forecasters say Florence will pass between Bermuda and the Bahamas on Tuesday and Wednesday and start its approach to the U.S. on Thursday morning. Tropical-storm-force winds are expected to start to reach the coast of the Carolinas on Thursday, the National Hurricane Center said. As the danger became clear over the weekend, the governors of North Carolina, South Carolina and Virginia all declared states of emergency. They urged residents to fortify homes and gather supplies. The U.S. Navy is also taking precautions, with the U.S. Fleet Forces Command ordering nearly 30 ships in the Hampton Roads area of the Virginia coast to head out to sea to avoid the storm. Vessels that can't leave port will prepare by a variety of means, from adding mooring and storm lines to dropping anchor and disconnecting shore power cables. Florence is currently projecting hurricane-force winds (74 mph and higher) up to 30 miles from its center. Forecasters say that because of the size the storm is expected to attain, it will wreak havoc regardless of how strong its winds are. Hurricane Olivia has triggered tropical storm warnings in Hawaii, where it is likely to make landfall by Tuesday or Wednesday, forecasters say. Florence is one of three hurricanes in the Atlantic Ocean, along with Helene and Isaac. Of the two other storms, which remain far from land, Isaac poses the most immediate risk. With winds of 75 mph, it's expected to strengthen a bit before weakening as it approaches the Lesser Antilles on Thursday. Dangerous storms are also threatening parts of the U.S. in the Pacific Ocean. 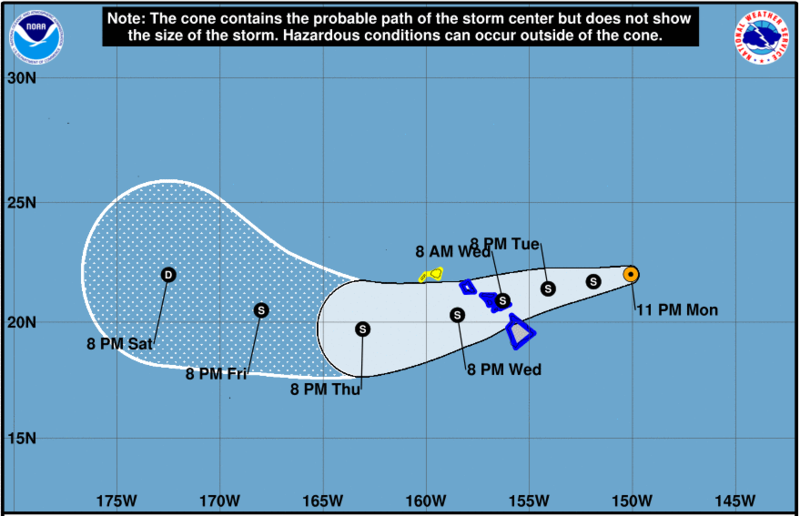 Most of the state of Hawaii was under either a tropical storm warning or watch on Monday morning, as Hurricane Olivia bears westward, with 85 mph winds. Olivia could weaken into a strong tropical storm within 48 hours, according to the Central Pacific Hurricane Center in Honolulu. But forecasters say residents should still beware of the chance for dangerous flooding and wind. In Guam, Typhoon Mangkhut — a Category 4 storm — narrowly missed dealing a direct blow to the island.